If you thought this online slot from casino giants, IGT, was all about mock-Tudor piles in Essex, Range Rovers in the drive, and teenage daughters called Chardonnay, think again: Nouveau Riche is actually inspired by the Art Nouveau movement of the early 20th Century. Therefore, on the reels we get plenty of artistic swirls and colors, lots of nicely-rendered icons and beautiful girls in dreamlike states. Win up to 5,000x Your Line Bet! The top-paying icon is the Nouveau Riche logo which pays out a jackpot of 5,000x your line bet. 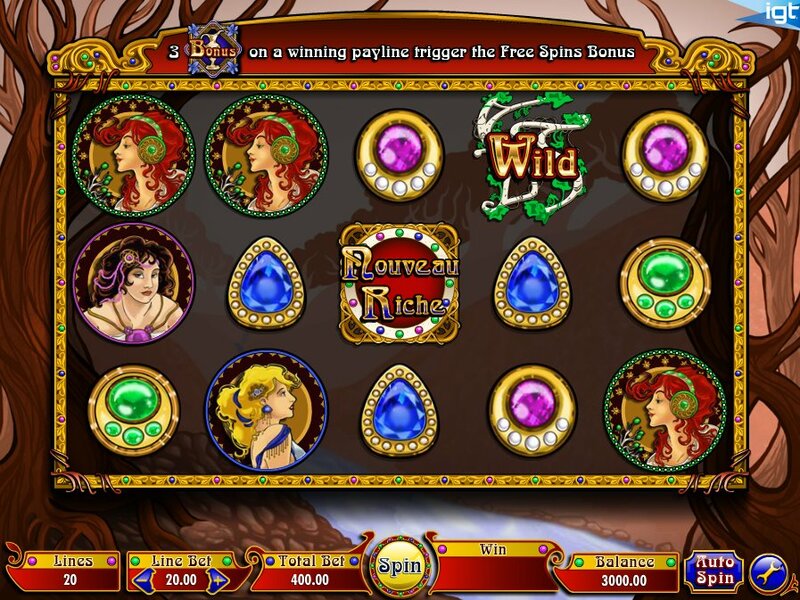 Elsewhere on the 5 reels in this 20 fixed paylines game there are three muses – a redhead, blonde and brunette – who are key to your bonus rounds later in the game. Making up the scant reel icons are three jewels – an emerald, a sapphire and a ruby. The Wild icon substitutes for all symbols other than the bonus icons. It only appears on reels 2, 3 and 4 but it does appear Stacked on the reels to give you bigger and better wins. Where Nouveau Riche differs from most slots is in its FreeFall Symbols feature. These are pretty much like Cascading Reels in slots by WMS or Avalanche Reels by NetEnt, but they work pretty much in the same way. Whenever you hit a winning combo on the reels the winning symbols will vanish to allow the icons above to drop into their place. This can lead to much bigger and better wins in the base game. 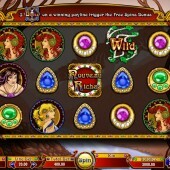 Three Bonus jug symbols on reels 1, 2 and 3 activates the free spins bonus round. You’ll have a choice of three muse beauties to pick from to determine your spins total first. Then it’s time to take your free spins. Wilds still operate during the bonus feature and you’ll also see +1 symbols if you’re lucky. These will – as the title suggests – award you bonus spins to add to your total. Although it seems a little tricky to activate, the bonus feature is what makes this game; that and the FreeFall reels method the game uses. The pay-lines are fixed so you’ll have to factor that in to your betting, but there’s definitely potential for some decent wins here. As for other slots out there with a nice line in arty themes, check out IGT's recently developed slot Masques of San Marco if you love a good FreeFall Symbols feature, while NetEnt’s Muse takes a similar female take on the arts.